Article printed in Sikh Shahadat magazine (May 2004). Shaheed Master Sukhwinder Singh Babbar was born on April 8, 1955 in village Daabaanvala, Batala, District Gurdaspur. His father was Sardar Bakhshish Singh and mother Bibi Jageer Kaur. Master Ji had 4 brothers and one sister. Master Ji first studied in village Aliwal and then went to Bering College Batala where he graduated and then went on to study at CPID Mohali. After graduating he took a job as a teacher in Kadeeaan. He began to be called “Master” after this point. Master Ji, along with his worldly studies also read a lot of Gurbani. He began to do the sangat of Sant Jarnail Singh Ji Khalsa Bhindranwale and after finishing his work at the school, used to go do sangat with Sant Ji. While teaching at the school, he also began to participate in the Dharam Yudh Morcha. The events of June 1984 broke Master Ji’s heart. He was so badly hurt that he resigned from his job and began to fight to protect the glory of the Sikhs and he never looked back again. Master Ji was firm on his principles and was a true soldier. He told everyone in the Jathebandi to take out their dasvandh and consider it their duty. Once, Master Ji went on a long trip on his bike to get RS100 in dasvandh from a Singh. A Singh in the Jatha asked Master Ji why he took such pains to go get such a small amount. Master Ji replied, “it was that Singh’s faith that he wanted to do seva and so his RS 100 is to me like a hundred thousand. On top of that, that Singh will be more attached to us now and if he was giving the dasvandh with such happiness, how could we refuse?” Master Ji served the Jathebandi with full commitment and soon he was chosen to be in the seven member High Command of Babbar Khalsa. After saying this, he left for his destination. No family member could say anything further to him and the entire night they wondered what the meaning was of all this. 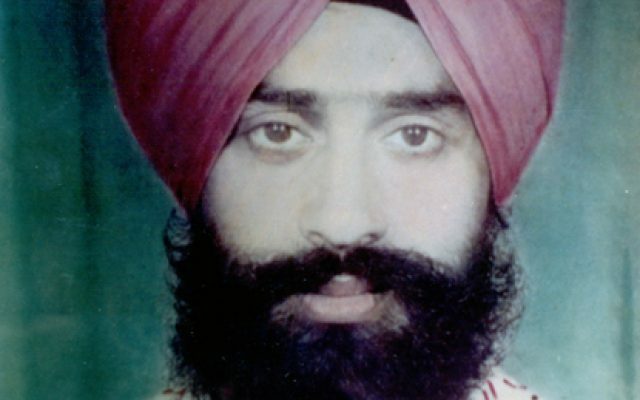 On March 23, 1987, two days later, the family received news that Master Sukhwinder Singh Babbar had been captured. After countless tries, the family could not get any further information. The police simply said they had not caught him. Soon after, the Jathebandi commemorated his Shaheedi.